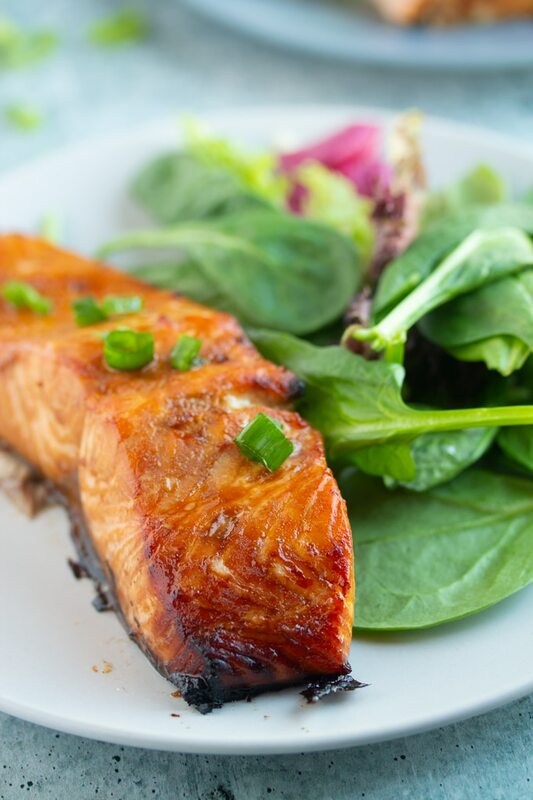 This Marinated Air Fryer Salmon recipe is a delicious and easy quick air fryer meal. 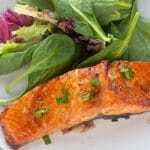 The Air Fryer cooks this salmon dish perfect each and every time. If I could give you one more reason to love your Air Fryer, than I think this is it. Perfectly cooked salmon in your Air Fryer each and every time. 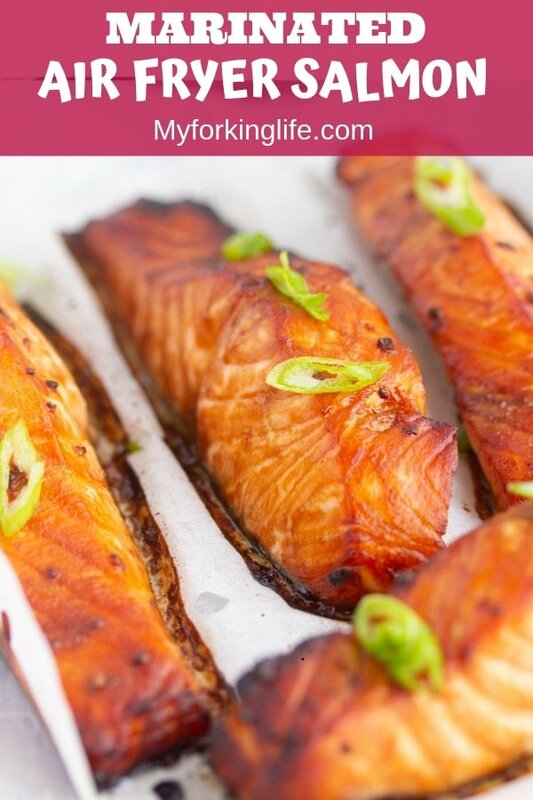 I’m a huge fan of making this Crispy Air Fryer Fish recipe, but now I’ll have to add this marinated salmon recipe to the list. It’s fast. 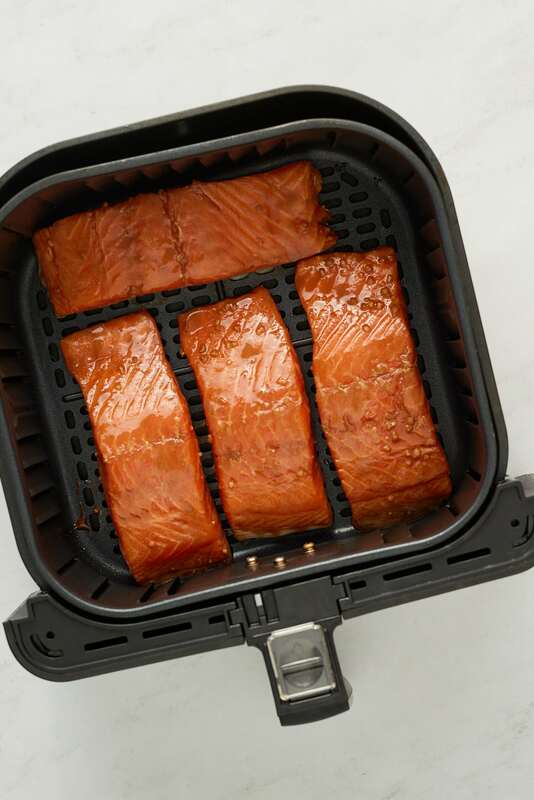 Salmon in your Air Fryer takes 12 minutes of cook time for a perfectly cooked and flaky fish. It’s so hands off. I just place my fish in the marinade for about 20-30 minutes and then straight in my Air Fryer. No flipping required! Because it’s perfectly cooked each and every time. Perfectly cooked salmon will differ from person to person. Some people like their salmon a wee bit undercooked while others like it well done. I found that a 12 minute cook time was perfect . Regardless, the thickest part of your salmon fillet should reach an internal temperature of 145 degrees Fahrenheit. You can find how to check if salmon is done here. 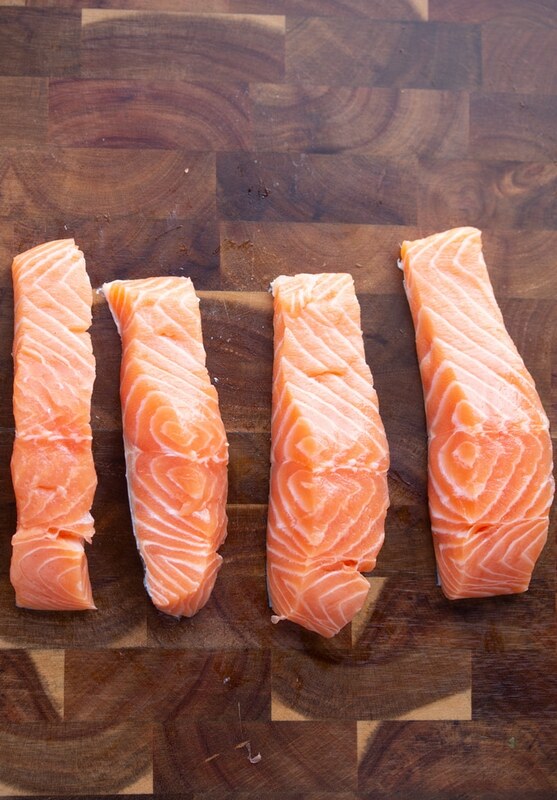 First, cut your salmon into 4 pieces. Some salmon fillets already come precut. That would work too. Whatever works best. Set aside. 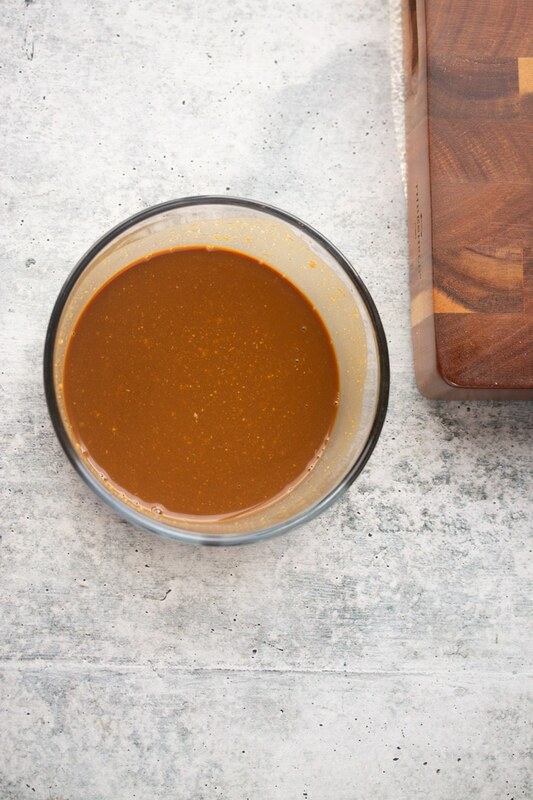 Place soy sauce, dijon mustard, brown sugar, and minced garlic in a bowl and whisk to combine. 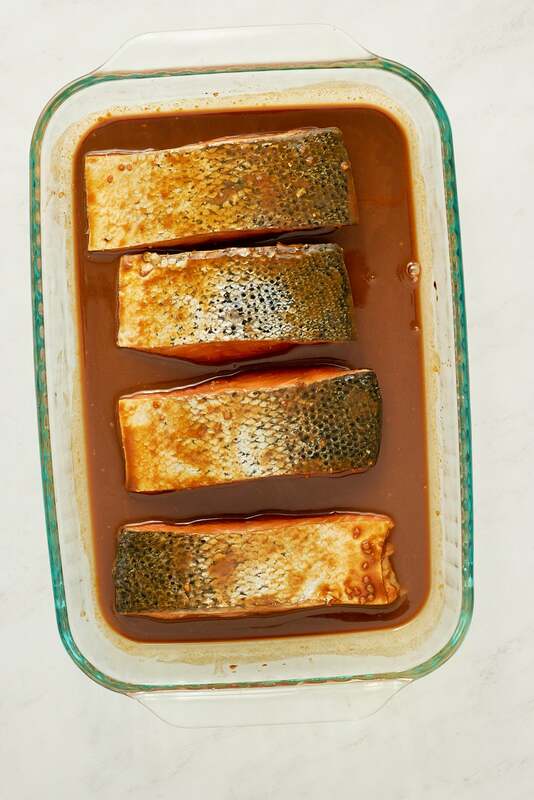 Pour marinade over salmon. I use plastic storage bags for marinating so I can gently swish the marinade over all the fish to make sure each piece gets fully covered. Place fish in the refrigerator and marinade for 20-30 minutes. Remove fish from refrigerator. Prepare Air Fryer basket by either spraying the basket with oil or using an air fryer parchment paper liner. These things are like my best friend when it comes to Air Frying. They make clean up a breeze. Cook salmon in your Air Fryer on 400 degrees Fahrenheit for 12 minutes. Make sure the salmon is not touching so that the air has a chance to flow around it. Once done, remove and plate. This does not produce a crispy skin if you are using the parchment liner. I use it to avoid the salmon skins sticking to the grate. Although the skin does not crisp up, the fish separates from the skin when eating. Your salmon is done if the thickest part of the fillet flakes easily with a fork. When in doubt, check the temperature with a quick read thermometer. The internal temperature should reach 145 degrees Fahrenheit. Looking for more Air Fryer Recipes? Try these out. This Marinated Air Fryer Salmon is quick, easy, and full of flavor. Make perfectly cooked salmon each and every time. Whisk soy sauce, dijon mustard, brown sugar, and minced garlic in a bowl. Pour over salmon fillets, making sure all filets are covered. Refrigerate and marinade for 20-30 minutes. 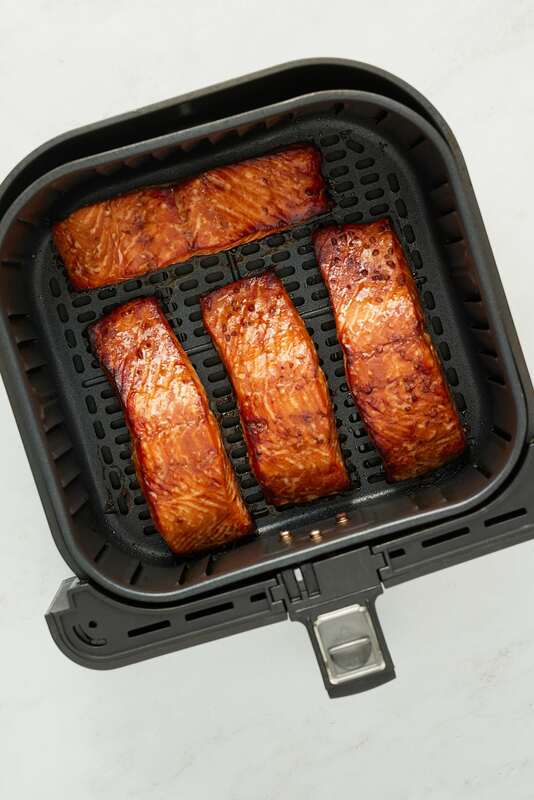 Remove salmon filets from marinade and place in greased or lined Air Fryer basket. Air fry for 12 minutes on 400 degrees Fahrenheit. I use skin on salmon. The fish flakes away from the skin after it's cooked. Desired doneness will depend on your preference. 10 - 12 minutes is a guideline. Your fish is done when the thickest part flakes easily. The salmon should be cooked to an internal temperature of 145 degrees Fahrenheit. Love my air fryer. Raw potato fries, frozen fries , pork chops raw and frozen. Just try it. Can’t wait to try this salmon recipe. Ooh! those crispy corners in the first photo are mouthwatering! This looks like the perfect way to cook salmon!! I have an air fryer but am yet to try recipes in it..still feeling skeptical..how is it? Love the flavors in the glaze! This salmon looks perfect! I don’t have an air fryer but that salmon marinade sounds delicious! I don’t have an air fryer yet but I think I’m going to need to get one asap! Great looking recipe!